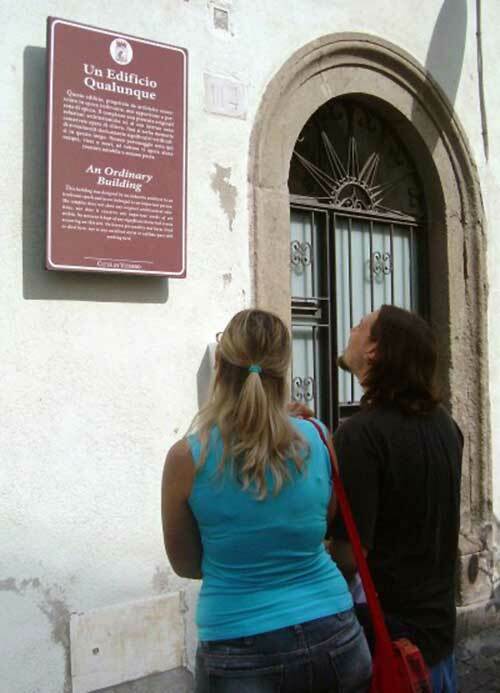 On September 20th, Eva and Franco Mattes (aka 0100101110101101.ORG) placed a sign on a building in the center of Viterbo, the ancient city in central Italy, not far from Rome. This building was designed by an unknown architect in an irrelevant epoch and never belonged to an important person. The complex does not show any original architectural solutions, nor does it conserve any important works of art within. No memory is kept of any significant historical events occurring on this site. No known personality was born, lived or died here, nor is any excellent artist or sublime poet still working here.